The question posed by this title may seem meaningless — but it is not. The reason why it is posed is the underlying issue: why should judges be trusted more than other branches of government? Our eighteenth-century forebears, like Blackstone, thought of their constitution as ‘mixed’, in the sense that it contained elements monarchical (the executive), aristocratic (the House of Lords and professional judiciary), and democratic (parliament, juries, and local government). These ‘checked’ each other, and had to act together for the most powerful effects. Even Montesquieu, who inaugurated the idea of the ‘separation of powers’, saw the ‘judicial power’ in England as resting in juries, not judges. 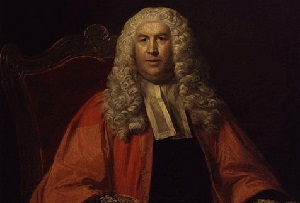 In 1688-89, the whole senior judicial bench was sacked, a number of their recent decisions were characterised by parliament as criminal, and the Lord Chancellor and one Chief Justice died in jail awaiting trial for them (the other Chief Justice fled into exile). For a century afterwards, the lay peers routinely voted in the judicial appeals, recognising a constitutional responsibility in their office to control the professional judiciary. For example, in Donaldson v Beckett (1774), the lay peers ruled by a 2:1 majority that there could be no copyright at common law, reversing the decision below reported as Millar v Taylor (1769), and rejecting the advice of the majority of the judges. They did so on the basis of the arguments of the then Lord Chancellor Lord Apsley and the former Lord Chancellor Lord Camden that it was unconstitutional for the courts to create new property rights. Since the middle of the nineteenth century, trust in the lay parts of the constitution has declined, while trust in the professional judiciary has tended to increase, albeit with ups and down over the years. But why should we particularly trust judges? A traditional point of view would say that, as a part of the aristocratic element of the constitution, judges can be trusted to protect property rights against the aspirations both of the executive, and of the hoi polloi, for taxation and expropriations. This, however, could hardly be an argument for a paramount trust in judges that could commend itself to the political left. More recently, and particularly since the ending of the spoils system of judicial appointments in 1945, the case for trusting judges has rested essentially on their professional commitments to the law as such. The idea is that judges’ professional commitments mean professional judges are more trustworthy than other branches of the constitution. But how deep do judges’ professional commitments to the stability of law as such go? Much in this territory can be and has been argued, most famously in J.A.G. Griffith’s The Politics of the Judiciary (Fontana 1977); much of the law Griffith and other similar authors have discussed is inherently politically controversial. Here, I want to give what I think is an example of judicial conduct which seriously calls into question judicial fidelity to law. In the early 1950s, a stable dogma of real property law, nearly 500 years old, was overthrown by the Court of Appeal for the sake of creating a loophole for landlords in the Rent Acts. It was only after the effective decontrol of private sector rents in 1980 that the House of Lords saw fit to restore an approximation to the orthodox doctrine. The instance is a striking example because it is in real property law, an area where long-term stability of the law is generally understood to be particularly important — because of the antiquity and stability of the original rule; because some of the early cases on the change make explicit reference to the Rent Acts, as implying that the rule should change; and because the change was substantially abandoned more or less as soon as rent control in the private rented sector was got rid of. It is thus a very spectacular example of the judiciary usurping the legislative power for the benefit of a class — landlords — at the expense of law or the ‘rule of law’. The doctrinal issue is the distinction between a lease or tenancy of land, which under modern law is a property right technically binding all the world, and a licence to enter land, which is technically a mere personal permission given by the landowner, which at most leads to the licensee having a contractual claim against the landowner in the event that it is part of a binding contract. The loophole in the Rent Acts was that these acts were so drafted as to cover tenancies and not licences. This was in itself sensible: a typical licence is an invitation to a dinner party, or a ‘contractual licence’, the position of a holder of a theatre ticket, or a hotel guest, and so on; and various arrangements in which the landowner is still in occupation of the land, while allowing the licensee to come on to it. Obviously, such arrangements should not be subject to rent control. It became an operative loophole when the courts became willing to say that arrangements in which the landowner moved out of occupation, leaving occupation to the ‘licensee’, were licences rather than leases. A lease was originally merely a personal right under a contract, like a modern contractual licence. From the 1230s onwards, however, the use of leases for periods of years led to the introduction of partial remedies for the lessee, first against purchasers from the lessor (1230s), then against unrelated third parties who evicted him or her (later 1200s), and then against those who created a ‘nuisance’ by pollution, and so on (1350s). By the 1460s, when Thomas Littleton wrote his property law book Tenures, the lease for years was beginning to be capable of being seen as an ‘estate’ in the land, a property right, as Littleton did in his book. So it became necessary to draw the line between leases and licences. The first case in which the point was argued was Prior of Bruton v Ede in 1470, in which the landlord argued that a licence to occupy amounted to a lease (if so, as a corporation they could only lease by deed). The case was settled out of court, but the point was treated as decided by an anonymous case in the 1480s, where it was also observed that a licence would only be a lease if the licensee’s occupation was exclusive (as opposed to cases where the landowner continued in occupation). By 1489, the rule that a licence to occupy is as a matter of law a lease was well enough settled to be used by counsel in Lord Dudley v Lord Pole to build an analogy: that a licence to take a necklace as security for a debt was, and hence should be pleaded as, a pledge. The court conceded the rule that a licence to occupy is a lease, but distinguished the case at hand. Thereafter, the basic rule that a licence to occupy land is as a matter of law a lease was repeatedly stated as a basic dogma, and used from an early date to build various analogies. It was applied as decisive in a good many cases. I give merely some dates: 1579, 1601, 1677, 1768, 1844, and 1899, and, by the Privy Council in 1867, 1904, and 1913. It is perfectly clear in the cases that (contrary to some modern interpretations) the rule was a rule of law, not a rebuttable presumption or rule of interpretation. In the nineteenth century, there was some tendency for the language used to shift from ‘occupation’ to ‘possession’. But down to the 1930s, the test used by the courts to distinguish tenant from licensee remained one of the factual occupation and control of the land, not one of the intentions of the parties. The rule was thus, as I have already said, stable over the better part of half a millennium. It was overthrown by a short series of cases mostly in 1951-52. These were Marcroft Wagons v. Smith (23 May, 1951), Errington v. Errington & Woods (19 December, 1951), Cobb v. Lane (1 April, 1952), and Facchini v. Bryson (7 April, 1952). I have given the full dates to indicate just how close together these cases were. The context of the change was the Rent Acts. Rent control was introduced in the UK as a war measure in 1915, in response primarily to the Glasgow rent strikes of that year and secondarily to lobbying from munitions manufacturers. After 1918, it proved to be politically impossible to move to full de-control, and rent control was extended in a series of acts while partial decontrols were introduced by Conservative governments, with full control restored in 1939. After 1945, Labour continued full control, eliminated the major loophole — the exclusion of furnished property — by the Furnished Houses (Rent Control) Act 1946, and eliminated a series of other judicially-created loopholes by the Landlord and Tenant (Rent Control) Act 1949. The politics was contentious. The Conservative party won office in 1951 with an internal belief — stronger at the grass roots than at the top — that ‘free market’ rents should be restored; but at the same time, with its senior leadership believing that it was politically impossible to move rapidly in this direction. It is in this context that the judiciary delivered the means for a non-statutory form of partial decontrol of the private rented sector by loopholing the new acts. The starting point was Marcroft Wagons v. Smith. The lead judgment given by Evershed MR is replete with anti-Rent Acts rhetoric, and explicit that the old rules as to occupation or possession leading to a tenancy have to be rejected in the light of the Rent Acts. Denning LJ is equally explicit: “it is no longer proper for the courts to infer a tenancy at will, or a weekly tenancy, as they would previously have done from the mere acceptance of rent. They should only infer a new tenancy when the facts truly warrant it”. Only Roxburgh J was a little more cautious. Next, came the celebrated case of Errington v. Errington. This case raised no Rent Act issues, since it concerned a family arrangement for the purchase of a house with the father providing the deposit and the son and daughter-in-law paying the installments. This should have been a straightforward case of a legal tenancy at will accompanied by an equitable right to a share in the property under the agreements between father, son, and daughter-in-law. The judgments of Somervell and Hodson LJJ were somewhat confused. Denning LJ introduced the Rent Acts issue into the case to justify finding that what was created was a contractual licence, on the basis of the hypothesised intention of the parties. Cobb v. Lane was similarly a case not about the Rent Acts, but about limitation of actions where a person had lived in a house for thirteen years under a family arrangement; if this was a tenancy at will, the claim of the estate of the paper owner was barred by the Limitation Act 1939. As in Errington, the existence of the Rent Acts was given by Somervell and Denning LJJ as a reason for reversing the old law as to the creation of tenancies. Finally, Facchini v. Bryson was a Rent Act case, and the court, led by Somervell LJ, was given the opportunity to show that ‘honest, guv’, they weren’t, as Denning LJ put it “[making] a hole in the Rent Acts through which could be driven — I will not in these days say a coach and four — but an articulated vehicle”. In reality, by adopting the ‘intention’ test they adopted in Marcroft, Errington and Cobb, they were revising the fundamental principles of land law in order to enable such a hole to be created. Facchini merely penalised poor drafting by the landowners’ lawyers, which had the arrangement described in one place as not a tenancy, in another as a tenancy. The effect of the loophole created was, in the long run, to undermine public support for rent control, since the bulk of private sector landlords could escape through it. There was little immediate political effect, because the incoming Conservative government introduced both a large-scale council house-building programme, and tax incentives for freehold-mortgage, so that the private rental sector became relatively marginal. But, by the 1970s, the squeeze had been put on public-sector house-building, and the remaining areas of rent control therefore appeared, to those who were unprotected thanks to ‘occupational licences’, as an unfair advantage for those still had rent-controlled tenancies. As a result, the Thatcher government was able in the Housing Act 1980 to largely formally decontrol the sector. Further reform in this direction followed. With the reasons for the new doctrine as a means of limiting the statute gone, the courts were able in Street v. Mountford (1985) and following cases to go a considerable distance towards returning to the long-term orthodoxy. Not completely, since ‘exclusive possession’ is still read as a matter of the terms of the agreement, rather than as ‘exclusive occupation’. But the partial return to orthodoxy in Street illustrates precisely that the point of the heresies in Marcroft Wagons and following cases was to drive lorries through rent control, and thereby set up the political conditions for its repeal. The effect, in turn, of the abolition of rent control has been the creation of housing benefit as a £23bn p.a. element of the welfare bill, roughly 17 per cent of that bill. Beyond that immediate cost to the taxpayer, there are probably other adverse effects both on the housing market, and on wage costs. Making housing policy in the Court of Appeal in the interests of landlords as a class has thus turned out to be very expensive in the long term. We probably shouldn’t trust judges to do this job. But this particular case has broader implications. As I said at the outset, the modern argument for trusting judges more than juries, and more than elected representatives (local or national), is that judges’ professional commitments to law and the rule of law make them particularly trustworthy. Griffith and others have argued before now that this view is false: judges have political commitments, commonly undisclosed and concealed behind a fiction of ‘merely following the law’. A common pro-judicial response to these arguments has been that the law in the field discussed is debatable, and it is not clear that the judges are acting for the political or other reasons complained of. Here, I have examined a single issue in relation to which it is clear: the old rule of law was clear and stable for centuries; the judges explicitly referred to the Rent Acts and the interests of landlords when they overturned it; and, once rent control was gone, the courts went a large part of the way back to the old rule. The clarity of this example supports the other, less obvious, examples. This is not a case for not trusting judges at all. It is a case for not trusting them to the extent that there is no check or balance on their conduct. It is thus a case against leftist support for judicial review of legislation on human rights grounds, or for the EU architecture that allows decisions of the Court of Justice on the treaties only to be overturned by treaty amendment, requiring unanimity. It is a case positively for a ‘mixed constitution’ approach rather than a ‘separation of powers’ approach: for elected representatives, and the general public, seeing themselves as having a constitutional duty to pay attention to what the courts are up to, and to keep the judges within limits, as well as the other way round. Mike Macnair is an Associate Professor of Law at the University of Oxford and Tutor in Law at St. Hugh’s College.